The unique event featured the World’s Top 16 athletes plus 2 wildcards. Living and exploring aboard The Moorings yachts, the athletes took part in one of the most spectacular surf events in recent years, with a completely mobile venue providing the ultimate surf adventure. The swell could have been better, it was mostly 2-3 foot (a bigger swell with 6-7 foot surf is hitting later this week) but the stunning scenery made up for this. The list of riders included SUP Legend Chuck Patterson and Sean Poynter from the US (who was ranking leader before the start) and Big Wave Surfer Dave Muir, Justin Holland and current number 3 in the world, Robin Johnston (Mistral), all three from Australia. From Hawaii came 2 x World Champion Kai Lenny (Naish) looking to defend his title, Zane Schweitzer (Starboard) and Noa Ginella (Naish), not to mention of course racing Champion and dark horse Stand Up Surfing talent, Connor Baxter. Then not to be forgotten 2 Brazilians: Leading light Leco Salazar and the breakthrough young athlete local celebrity Caio Vaz (Art in Surf). France was represented by the young phenomenon Benoit Carpentier from France. Qualified but missing were Antoine Delpero (France) and Mo Freitas. Finlandia’s Location X Finals presented by The Moorings and Starboard started with a welcome breakfast at Myett’s in beautiful Cane Garden Bay, Tortola, which is also home to a powerful reef break, which only breaks in big swells. The swell was not big enough for this, so the Yachts took off to the northernmost of the British Virgin Islands, Anegada, which is most exposed to swell. It lies approximately 15 miles (24 km) north of Virgin Gorda. Anegada is formed from coral and limestone. While the other islands are mountainous, Anegada is flat and low. It is known for miles of white sand beaches and the 18-mile (29 km)-long Horseshoe Reef, the largest barrier coral reef in the Caribbean, and the fourth largest on earth. It is also famous for it’s lobster. After a rough 3 hour plus crossing in heavy seas, the crew arrived at the remote island to find surf in the 2 – 3ft range – still in the trade wind swell pattern, the waves were softer than normal, but provided enough for the competitors to break the ice with the first round of competition. While conditions were not ideal, there was a wide playing field with a lot of scoring potential. Stand outs from the first day were Brazil’s Caio Vaz (Art in Surf), who put together an impressive heat, linking together fluid and radical turns to score the highest heat total of the day. Sean Poynter (Starboard) kicked off his event campaign with a win in his first heat against fellow team mate Connor Baxter (Starboard). Robin Johnston (Mistral) and Justin Holland (Starboard) secured their places in Round 3. Close heat battles created for some dramatic finishes in Anegada. The first being between team mates the young Frenchman Benoit Carpentier and Noa Ginella (both Naish), as they went wave for wave, with Benoit taking the win by a matter of decimals. Meanwhile Big Wave Surfer Dave Muir (Starboard) demonstrated that his skill is not limited to big waves with a strong showing in his heat against Chuck Patterson (Naish). However, late in the heat, Chuck managed to find a good section to hit and score the points he needed to advance directly to Round 3, again by a matter of decimal points. Leco Salazar from Brazil put on a fluid display of performance surfing to secure his spot in Round 3 in his heat against California’s favorite son, Dave Boehne. After 2 days in Anegada, the fleet sailed back to Apple Bay, Tortola for a dramatic and emotional finish at the infamous “Bomba Shack”, where the Brazilian Leco Salazar was crowned not only event winner, but 2012 World Champion here on the Stand Up World Tour. 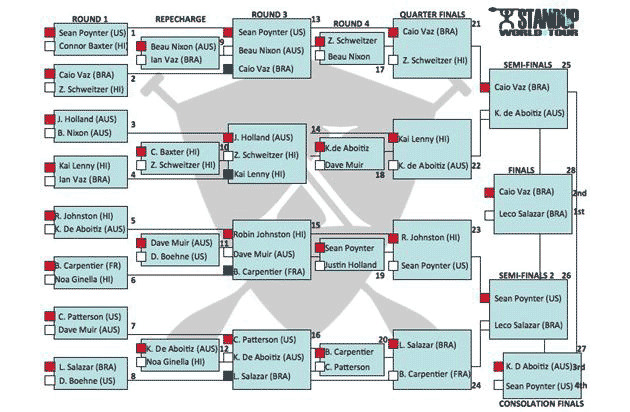 Leco was in the bottom half of the draw and quietly worked his way through the rounds only to meet his primary adversary, Sean Poynter (Starboard) from the USA in the semi finals. In a fiercely fought out heat, Leco put on a clinic of backhand surfing, taking the win to advance into the Finals. But it was not over yet, as Leco would have to win the event in order to secure the Title, something he did in style against fellow countryman and friend, Caio Vaz (Art in Surf). Proudly carrying the Brazilian flag up the beach that had been carried by his father before him, Leco achieved the ultimate goal of any athlete – the World Championship Title: Congratulations to our new World Champion Leco Salazar! In a nail biting finish, Sean Poynter (Starboard) sighed a huge sigh of relief when Kai Lenny (Naish) fell short in the quarterfinals and he advanced through to the semis, but then faced what turned out to be an insurmountable challenge in the form of Leco Salazar and his quest for the crown. With the Title at stake, Sean put it all on the line, but was unable to take down the Brazilian in the second semi final. However, Sean’s hopes for the Title were not over until the final buzzer of the final, as a slip up from Leco in the Final would have allowed Sean to maintain his rankings lead and secure the World Title – it was that close, but it was not meant to be. The rest was history, as Sean graciously accepted defeat, and congratulated the new World Champion, Leco Salazar. 2 x World Champion Kai Lenny (Naish) was on fire throughout the competition, posting some of the highest scores of the event, and showcasing some of the most progressive stand up paddling to date. However, in the tightest heat of the event, Kai was ousted by another on form athlete, Keahi de Aboitiz (JP Australia) from Australia, who managed to put together a strong heat and select the best waves to advance over the 2010 and 2011 World Champion by a margin of 0.07! As ever, Kai Lenny was a consummate professional and graciously accepted defeat, but one thing is clear – he will be back and on a mission for the 2013 season. Going down to Sean Poynter (Starboard) in the quarterfinals, Robin Johnston (Mistral) was able to maintain his 4th place overall with a 5th place finish in the BVI. For the 3rd year in a row, Robin has succeeded in staying right up there in the mix as one of the most consistent riders on Tour. Caio Vaz (Art in Surf) was certainly one of the on form surfers of the event, posting some of the highest scores from the outset and finishing his first full year on the Tour in style. His fluid style punctuated by radical snaps and progressive moves wowed the judges and took him all the way to the final to battle it out with fellow countryman and now 2012 World Champion Leco Salazar. He also rattled the ratings leader coming into this event Sean Poynter (Starboard), taking him out in Round 3 and forcing him to go to the repecharge to come back into the running. Caio finished off the year in 5th place overall. The event ended with a price giving at the last resort, where the riders showed that they could party as hard as they could paddle. Of note was the amazing music performance in which Dave Muir (drums), Robin Johnston (vocal) and Justin Holland joined the Singing Chef (Al Broderick) on stage. Congratulations to all winners and a big thank you to the sponsors: Finlandia, The Moorings, BVI Tourism Authority, Starboard, Digicel, Road Town Wholesale, Myett’s, Bitter End Yacht Club and Last Resort. Pics of the surf action can be found here. If you are interested in SUPing in the BVI yourself, check out the details of the 2013 HIHO adventure race! The video with the highlights is below. The Stand Up World Tour’s presence on NBC continues this month with an airing this weekend at 3pm EST / 12pm PST / 10am HST on World of Adventure Sports. The show is hosted from the British Virgin Islands and will look back at the year on Tour through all its dramatic stops, only to end with the Location X Finals and the culmination of the 2012 Stand Up World Tour. So make sure to tune in at 3pm (EST) this Sunday 23rd December to watch an epic look at another incredible year for the Stand Up World Tour. Next up, the now iconic Sunset Beach Pro that will take place from the 7th – 15th February on Oahu’s fabled North Shore. Stay tuned for a build up to this unique event, that will see the return of some of the heavyweight Hawaiians as they step up to do battle with the World’s very best. As we saw in 2012, they are dangerous, highlighted by Bonga Perkins’ win and Ikaika Kalama’s finals berth. However, 2x World Champion and 2x winner at Sunset will be looking to restake his claim on the event and the World Title in February, as the journey towards the coveted Title picks up again and the action turns on. Powerful Frenchman and 2010 vice World Champion Peyo Lizarazu will also be back to keep his 100% record of Finals finishes at Sunset alive.